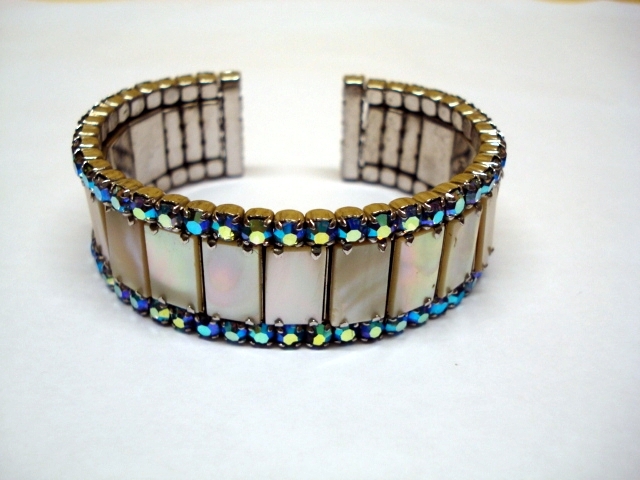 This Vintage Bracelet is really gorgeous. 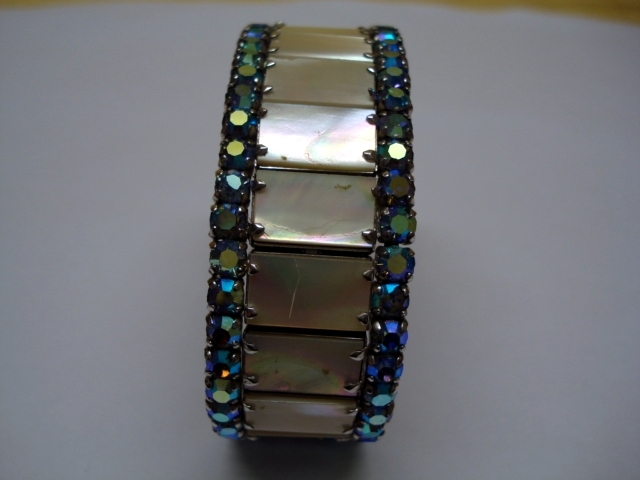 It is a Cuff style bracelet, the kind that were in fashion in the late 1950's to the early 1960's. It features 15 individual claw-set rectangular panels of natural Mother of Pearl Shell around the middle. These irridescent mother of pearl rectangles shine pearly white with hints of pink, green and blue. 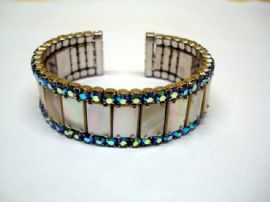 Around both edges of this lovely bracelet are over 100 individual claw set Austrian crystal gems. These crystals are known as 'Aurora Borealis' as they twinkle like the stars in the night sky! Vintage Costume Jewellery pieces are often set with these amazing stones, which are faceted cut glass crystals with a metallic coating which ensures they sparkle with shades of blue, pink, purple and green. The photos show it more green than in real life. 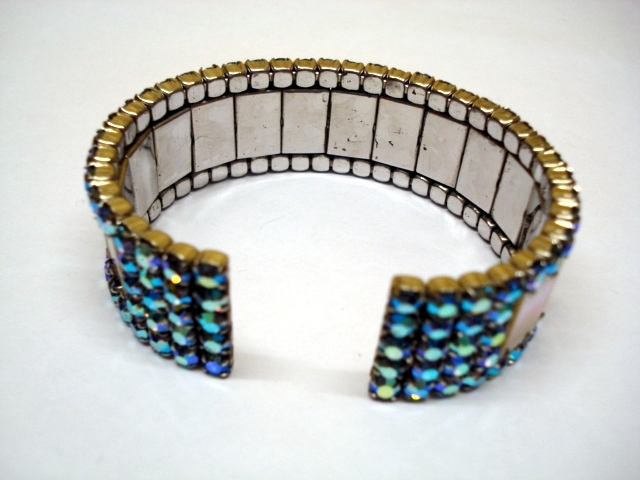 The costume fashion of the late 1950's and early 60's meant that ladies would often wear a bracelet like this over a long cocktail glove and this vintage bracelet would look amazing on a gloved hand for a ball or formal outing. 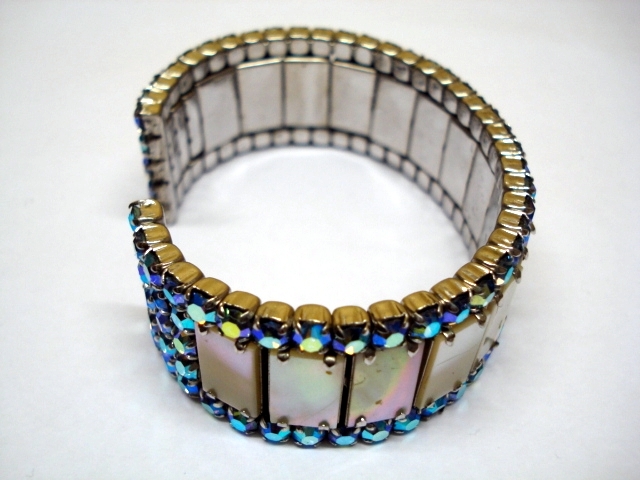 This vintage fifties bracelet is in great shape with every crystal present and shiny and the panels of mother of pearl bright and lovely with just a teeny,tiny surface scratch to one panel that doesn't spoil it at all. The Bracelet, which is 2cms wide, would fit most medium sized frames as it is flexible with an opening to make it easy to fit onto the wrist. It is finished in a Rhodium plated, silver tone metal. This vintage bracelet would be a wonderful addition to your antique costume jewellery collection as it is quite a rare find in these colours. More often clear diamante were used with mother of pearl in necklaces, earrings and bracelets. 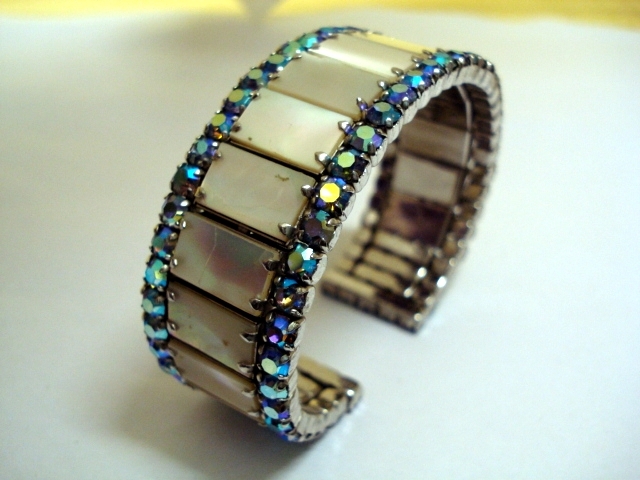 so the choice of Aurora Borealis combined with the pearl panels for this vintage piece makes it just a bit special!